Fall Registration begins August 2. There will be no Open Gym hours on Mondays during August. Women’s Indoor Soccer on Friday nights from 6:30 - 8:30 p.m. is a great workout. All levels welcome. Drop-in fee only $5. This fall, get out and play with SF Rec and Park! Registration begins Saturday August 2 at 10 a.m.
Sign up for classes in person at Upper Noe Rec Center. To register online, log onto sfreconline.com. Browse the catalog of nearly 1,400 classes and programs including yoga and fitness classes for adults, dance classes for seniors, and art and sports programs for kids at http://sfrecpark.org/wp-content/uploads/FALL_FINAL.pdf. See http://www.noevalleyreccenter.com/at-the-center/sf-rec-and-park-classes/ for a list of classes offered for summer at Upper Noe. Girl's basketball - Wednesdays beginning 9/17 5-9 yrs old 3:00-4:30 p.m. Girl's basketball - Wednesdays beginning 9/17 10-14 yrs old 4:30-6 p.m.
Home Cooking 101 - Thursdays beginning 8/21 Adult 6:30-8:30 p.m.
Art of Baking Bread - Saturdays beginning 8/23 Adult 10:30 a.m.-1 p.m.
Art of Holiday Cooking - Thursdays beginning 10/23 Adult 6:30-8:30 p.m. Flag Football Coed - Wednesdays beginning 9/3 8-9 yrs old 3:30-4:30 p.m. Flag Football Coed - Wednesdays beginning 9/3 10-11 yrs old 4:30-5:30 p.m. Flag Football Coed - Wednesdays beginning 9/3 12-13 yrs old 5:30-6:30 p.m.
Theater & Performing Arts Mini-Players - Thursdays beginning 9/18 5-6 yrs old 4:30-5:30 p.m.
Food in Jars Adult - Wednesdays 6:30-8:30 p.m.
Bootcamps Adult - Tuesday 7:45 and Saturday 9:30 a.m. So You Think You Can Act - Fridays 7-11 yrs old 3:30 p.m.-4:30 p.m.
Movin' and Groovin' 2-4 yrs old - Tuesday and Thursday 11:30 a.m.
Shred and Butter 6-13 yrs old - Fridays 4:30-6 p.m.
Everyone knows that programs there fill up fast. What many do not know is that a Randall Museum Friends Membership provides discounts on classes and priority registration. This is crucial. Get to the front of the line. See http://www.randallmuseum.org/memberbenefits.aspx for details. People often ask, "How can I be more involved with the park?" That is easy to answer. Pick up litter, report maintenance problems (through 311 or to park staff) and volunteer with the Ladybug Gardeners to help keep the grounds in great shape. But to take part in the discussions and decisions that affect events, programming and improvements, be part of the Upper Noe Community Recreation Council (CRC). The CRC is a Rec & Park initiative, run by Facilities Coordinator Cheryl Woltjen, which works very closely with the Friends of the Noe Valley Recreation Center (FNVRC). Together, they meet as one body once a month to share a common agenda. The advantage of this arrangement is that the CRC can tap into the vast resources of Rec & Park directly to bring equipment and staffing to events, while FNVRC functions as a non-profit, community-run organization able to raise monies through donations and grants to support activities and fund improvements. Everyone involved in caring for Upper Noe is considered a Friend, regardless of any monetary contribution. What is most valuable are participation and ideas. In particular, the CRC is seeking more input from parents to help decide which programs and events they would like to see here for their children. What kind of improvements would be of benefit to tots? To teens? Is there something you would like to see happen here? Bring it to the CRC. Reservations are not required. The CRC is open to everyone. Currently, the CRC is considering a series of outdoor movie nights for next summer. Sound like fun? The next meeting is Wednesday, August 20 at 7 p.m. The results are in. 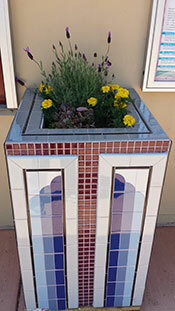 Readers of this newsletter responded 100% in favor of keeping the planter that mysteriously appeared two months ago. Ladybug Gardner Joan Lionberger has recently added flora and it is lovely. Thanks go out to our mystery donor, to Joan, and to our readers who weighed in on whether to keep it or not. On July 9, Upper Noe Neighbors hosted a lovely get-together with S.F. Supervisors David Campos and David Chiu. The two face each other at the ballot in November. Their quest is Assemblyman Tom Ammiano's termed-out spot in Assembly District 17 of the California Legislature. In an informal setting, the supervisors amiably discussed their platforms and fielded questions from the audience of about forty neighbors. There were no surprises. Neither deviated much from campaign literature. While each strived to distinguish himself from the other, the tone was always civil and each remained a gentleman. It was refreshing. 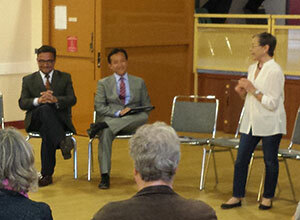 Thanks go out to Vicki Rosen for putting together such a pleasant, informative evening. And the snacks were delicious. Upper Noe Neighbors meets quarterly at the Rec Center. This month Friends Concert in the Park welcomes Uni & Her Ukulele. Uni has released three full albums, numerous E.P’s, collaborations and a covers album ranging from lo -fi indie pop to melodic strings to rock. Uni’s sound has been described as eclectic, infectious pop and not your usual Ukulele fare. 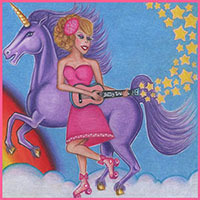 Recipient of the SF Weekly Music Award, Uni has toured all over the USA and Canada, Europe, Australia and New Zealand and has been the subject of celebrated festival Documentary ”The Mighty Uke”. Upper Douglass Dog Park reopened Tuesday, July 29, with fanfare. A host of public officials were on hand to bestow their blessings upon this truly magnificent green space. After a major renovation to address drainage and landscaping issues, the park looks great and drains well. Having this play area back should relieve some of the congestion in Upper Noe’s Joby’s Run. • Garden at the Park. Help keep the park beautiful by volunteering with the Ladybug Gardeners on the second Saturday of each quarter. The next date in 2014 will be June 14. All ages welcome, no experience necessary, community service hours credited. Even an hour would be a big help! Please email ladybugs (at) noevalleyreccenter.com. Rain moves the concert inside. A free community BBQ / celebration bringing neighbors together in a safe and friendly atmosphere where they can also get to know the law enforcement officers that serve them. Jumpy houses, face painting, balloons, balloon art, popcorn and other giveaways for the kids.